Indulge in this deliciously simple and oh-so-comforting carrot souffle recipe. In a season of all things orange, it’s only natural to keep up with the autumn theme. This carrot souffle recipe is as easy and straightforward as it gets. It makes good use of root vegetables and complements their inherent earthiness with creamy textures and spicy overtones. The stars of the show are the carrots and parsnips, so in order to truly enjoy this dish, it’s important to source your vegetables from the purest and most honest place possible – think: organic and local. I oftentimes find conventional, non-local carrots to taste super bland. It didn’t bother me until I started getting my carrots from a local farm, and the taste was so different, I couldn’t go back to my old produce-purchasing ways. 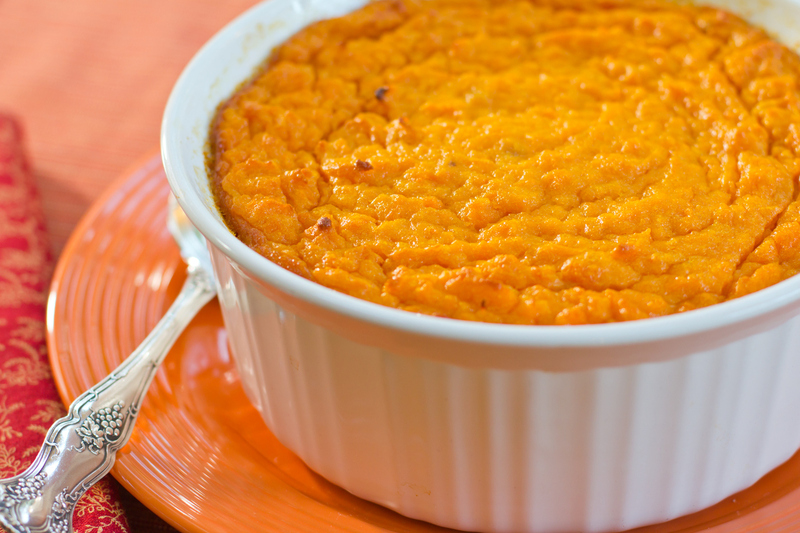 This rule goes for all the ingredients in this carrot souffle recipe’s list. Use organic milk from grass-fed cows, a grass-fed raw goat variety of cheddar cheese, and pasture eggs. The dish tastes that much better when you know you’ve put in extra thought and intention into it. Preheat oven to 350 degrees Fahrenheit. Grease a 9×13-inch baking dish with butter. Set aside. In a saucepan over high heat, add carrots, parsnips, and water that rises an inch up the side of the pan. Add one teaspoon of salt and stir. Bring the mixture to a boil and then reduce heat to a simmer. Let simmer for about 10-15 minutes, or until the carrots and parsnips are tender. Strain the mixture and transfer the carrots and parsnips to a food processor or high-speed blender. Blend until smooth. Transfer the carrot and parsnip puree to a bowl. Slowly whisk in the milk. Fold in the cracker crumbs, grated cheese, onion, butter, remaining salt, cayenne, cinnamon, and black pepper. In a separate, smaller bowl, whisk the eggs until frothy. Once frothy, fold them into the carrot and parsnip puree. Pour the mixture into the greased baking dish. Use a spatula to spread the top of the souffle evenly before popping the baking dish into the oven. Bake for 40-45 minutes until lightly golden.